December 03, 2018, 9:58 a.m. Humans, as is often remarked, don’t deserve dogs. The unconditional love that humans receive from our canine companions is more than we can ever have hoped to have earned. Many puppers go above and beyond for their human masters, and the actions of hero hounds can frequently be found in the news. In celebration of all that our furry friends do for us, YouGov Omnibus is highlighting the very best of Britain’s mutts by ranking the nation’s goodest dogs from the previous 12 months. 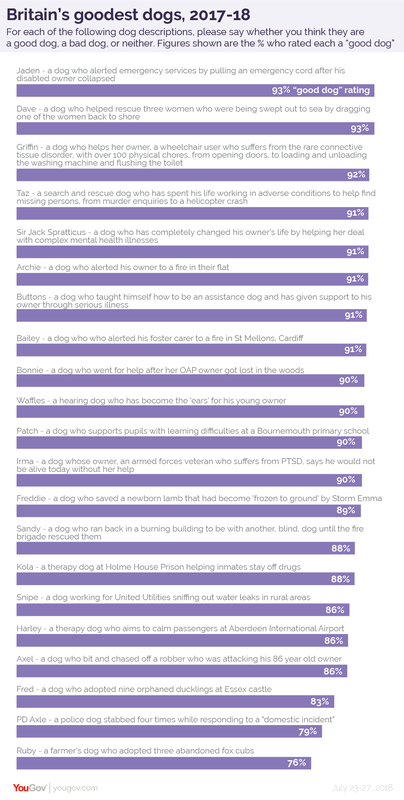 YouGov selected 21 dogs who had made the news for their positive actions between August 2017 and July 2018 and asked 6,000 Brits whether or not they considered each pooch to be a “good dog”. Who’s a good dog? All of these! Coming in joint first place, with a 93% good dog rating, are Shih Tzu Lhasa Apso cross Jaden and black Labrador Dave. Jaden alerted emergency services after his disabled owner collapsed by pulling an emergency cord, while Dave helped rescue three women who were being swept out to sea by dragging one of them back to shore, while his owners rescued the other two. In third place is Griffin, who 92% of Brits consider to be a good dog. Griffin helps her owner, a wheelchair user who suffers from a rare connective tissue disorder, with over 100 physical chores, from opening doors, to loading and unloading the washing machine and flushing the toilet. Griffin’s service has already been recognised with the Labrador/Golden Retriever cross one of five finalists in Crufts’ 2018 Friends for Life award. Of the 21 dogs listed, 12 received a good dog rating of 90% or higher. Even the lowest scoring dog – Ruby, a farmer’s dog who adopted three abandoned fox cubs – scored a 76% good dog rating. No more than 3% of Brits had the stone heart required to brand any of the pooches a “bad dog”. 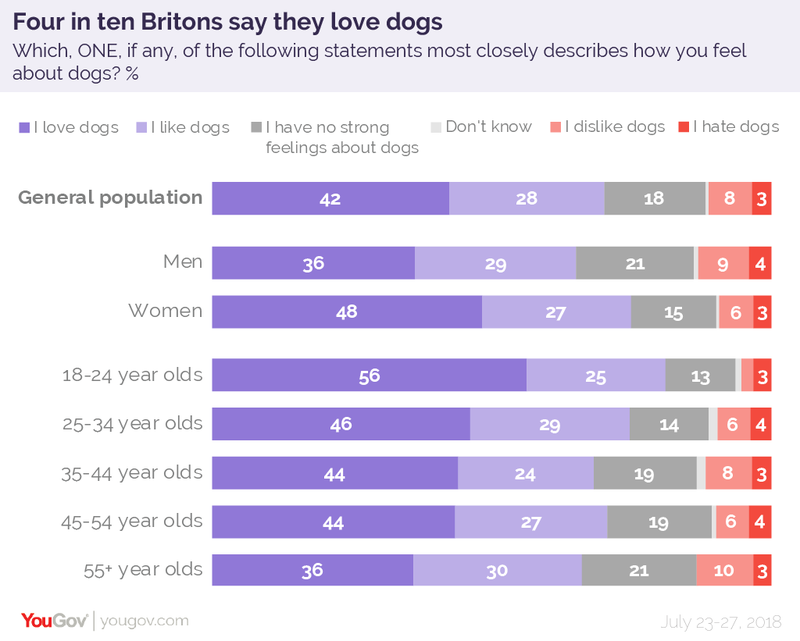 The survey also reveals that 42% of Britons love dogs, including 48% of women and 36% of men. A further 28% of people say they like dogs, while only 11% actively have a negative opinion of man’s best friend.